I am happy to announce the beginning of the Baruch Distinguished Mathematics Lecture Series. In this series we will bring established mathematicians to give talks to a general mathematical audience. Our first Distinguished Lecture, by Bjorn Poonen, will be “Undecidability in Number Theory”. Click here for the full details. The talk is open to everyone, and includes refreshments. After the talk we will also go to lunch with the speaker. I am excited to announce the official start of our new Discrete Geometry group! This event will also be the first meeting of the NYC Geometry Seminar in the CUNY Graduate Center (midtown Manhattan). It will take place at 2pm of Friday August 31st. If you are in the NYC area and interested in Discrete Geometry and related topics – come join us! The introductory meeting would not consist of the standard seminar presentation. 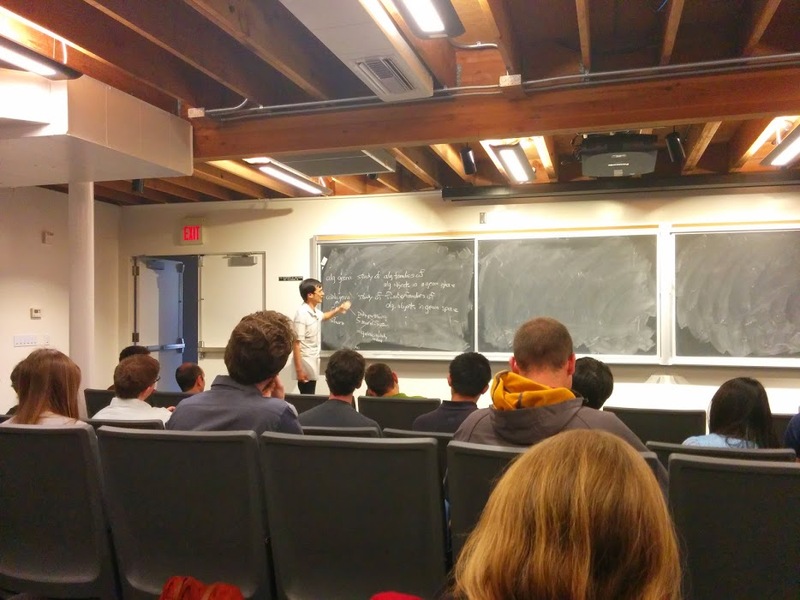 Instead, the purpose of the event is to meet people who are interested in Discrete Geometry, Computational Geometry, and so on (with people coming from NYU, Princeton, various CUNYs, etc). Participants will introduce themselves to the audience and mention the main topics that interest them. You are welcome to either introduce yourself, or just to come listen and have some pastries. If you introduce yourself, you are encouraged to briefly state a major open problem you wish you could solve. For the exact location, see the event page. Personally, I plan to have more technical math discussions with some participants before and after this meeting. Zeev Dvir and Cosmin Pohoata. Let denote the minimum size can have, when is a set of real numbers with the property that for any with we have . That is, by having a local additive property of every small subset, we wish to obtain a global additive property of the entire set. For simplicity, we will ignore zero in the difference set. Similarly, we will ignore negative differences. These assumptions do not change the problem, but make it easier to discuss. As a first example, note that is the minimum number of differences determined by a set of reals with no 3-term arithmetic progressions. Behrend’s construction is a set of positive integers with no 3-term arithmetic progression and . Thus, . That is, when moving from to , we move from a trivial problem to a wide open one. My work with Cosmin Pohoata leads to the following result. Since not much is known for this problem, it seems plausible that additional bounds could be obtained using current tools. Our technique does not rely on any additive properties, and holds for a more abstract scenario of graphs with colored edges. Hopefully in the case of difference sets one would be able to use additive properties to improve the bounds. Moreover, so far I know nothing about much smaller values of , such as . To obtain a lower bound for , it remains to derive an upper bound for . For let denote the set of with (so ). For , let be the set of points that participate in at least one of the representations of . If there exist such that , then there exist a subset with and (see the paper for a full explanation). Thus, for every we have that . We have sets with . These are all subsets of the same set of size , and every three intersect in fewer than elements. We now have a set theoretic problem: How many large subsets can have with no three having a large intersection. We can use the following counting lemma (for example, see Lemma 2.3 of Jukna’s Extremal Combinatorics) to obtain an upper bound on . Lemma 2. Let be a set of elements and let be an integer. Let be subsets of , each of size at least . If then there exist such that . Lemma 2 implies the bound for large values of . Combining this with and with a couple of standard arguments leads to . Combining this with implies . I’ve been quiet for a couple of weeks because I am doing some traveling. My first stop was The 2nd Elbe Sandstones Geometry Workshop. This workshop had an interesting location — a mountain in the middle of nowhere in the Czech Republic. Here is a picture of most of the participants. 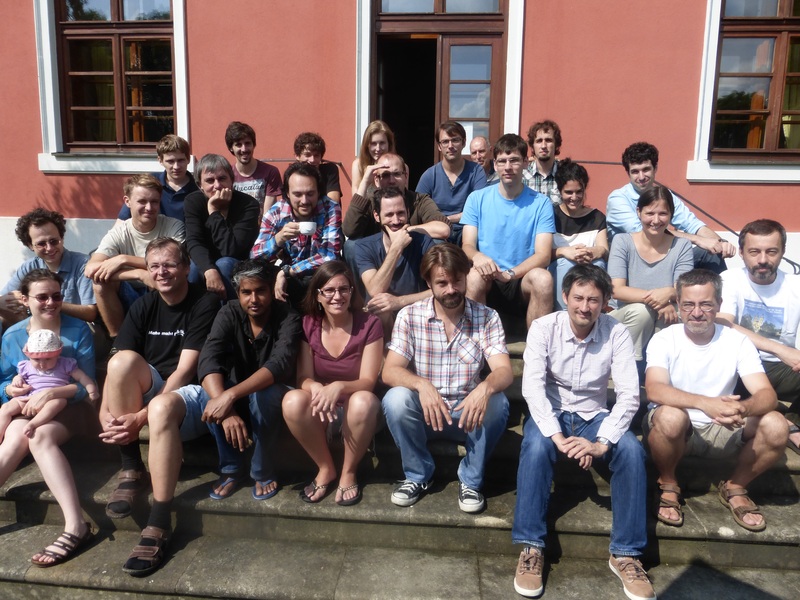 The 1st Elbe Sandstones Geometry Workshop took place 13 years ago. Following is a picture from there, in front of the same door (it is also the only picture I ever saw of Micha Sharir without a beard). This post is another brief update from the ongoing IPAM semester on Algebraic Techniques for Combinatorial and Computational Geometry. If you are not in Los Angeles but are interested in these topics, you can now view videos of many of the talks that we had here. Talks from the tutorials week can be found here. Talks from the workshop “Combinatorial Geometry Problems at the Algebraic Interface” can be found here. I assume that talks from the workshop “Tools from Algebraic Geometry” will also be available soon. A talk by Joseph Landsberg. Another brief update: You might remember that in my previous IPAM post I was excited about a talk by Larry Guth. Not only that you can now watch the video of this talk, but you can also read the paper. It is like defining a ham sandwich as “what you have in your lunchbox after taking the apple out”. Ben Lund, unsatisfied with a famous textbook’s definition of Grassmannians. After three weeks without any main events, another workshop begins tomorrow. So more updates will follow. Since my previous post, I moved from freezing New York to sunny LA. 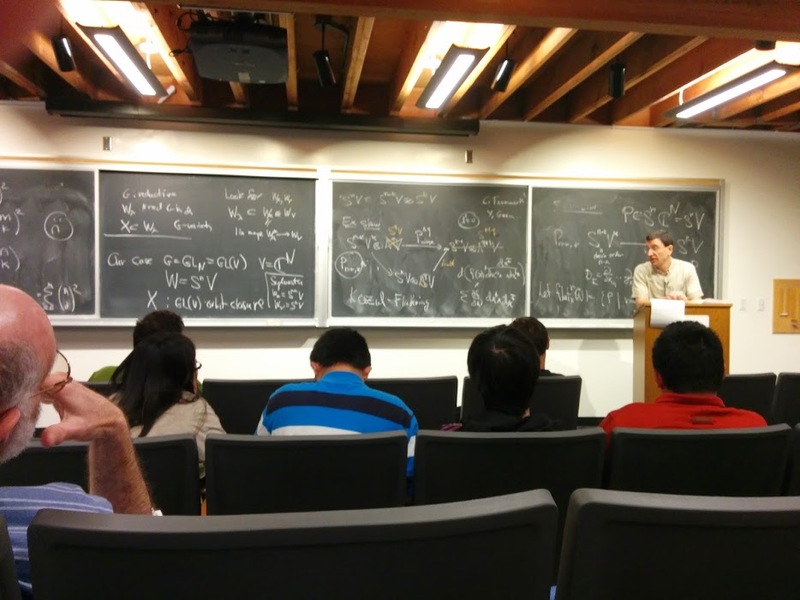 I am participating in a semester on Algebraic Techniques for Combinatorial and Computational Geometry, at the IPAM institute. The lack of posts on the blog in the past several weeks is due to the constant activities and the large number of interesting people to interact with. 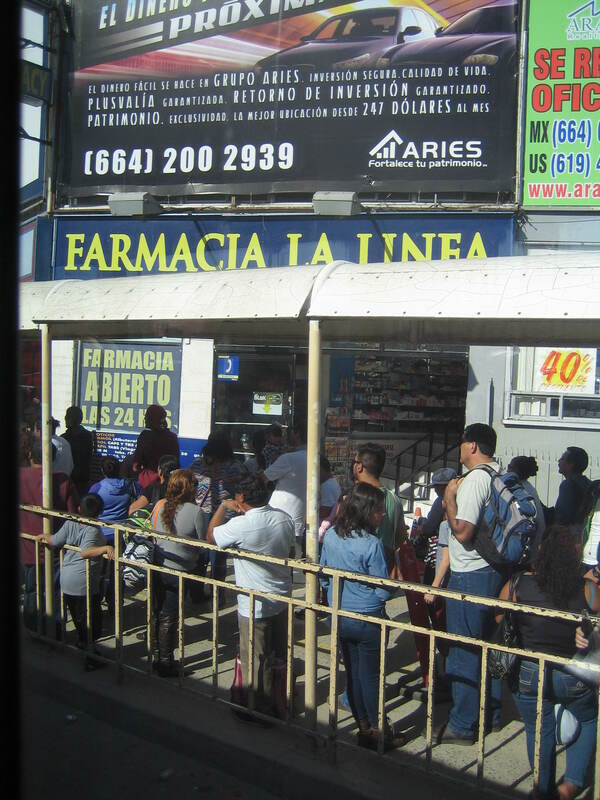 This post contains some random stories from my stay at IPAM. 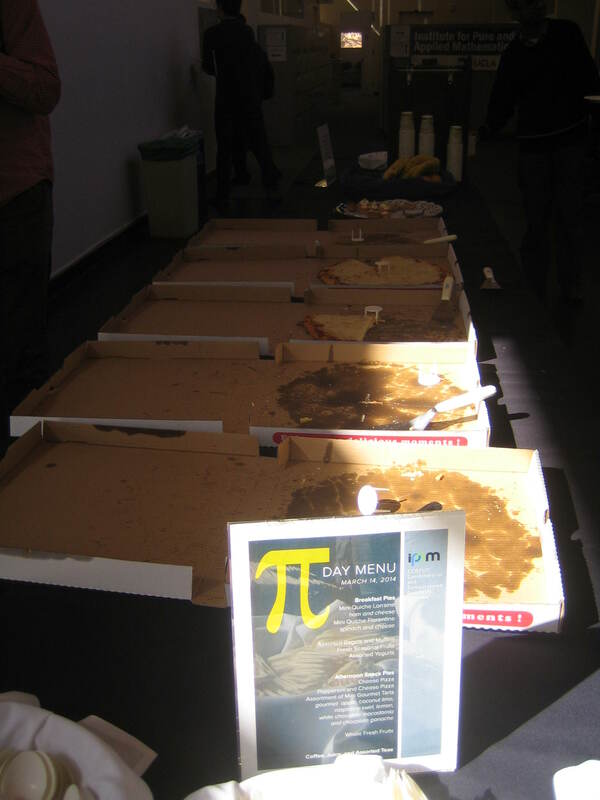 During pie day (March 14th), all of the food served in IPAM was round. So far the main events were a week of tutorials and another week consisting of a workshop about “Combinatorial Geometry Problems at the Algebraic Interface”. These contained many interesting talks, which were also videotaped. Once the videos will be online, I will post a link in the blog. Here I only mention one talk which gave me quite a surprise – Larry Guth‘s talk. At the beginning of his talk, Larry stated that he will present a significantly simpler variant of part the distinct distances proof (the one by Katz and himself). You might remember that, using the Elekes-Sharir framework, the distinct distances problem is reduced to a point-line incidences problem in : Given a set of lines, such that every point is incident to at most of the lines and that every plane and regulus contain at most of the lines, what is the maximum number of points that can be incident to at least of the lines (where ). Larry’s new technique proves the following slightly weaker incidences bound. The surprising part is that the new proof was based on constant sized partitioning polynomials (on which I plan to write a couple of expository posts, as part of my expository series about the polynomial method). When using such polynomials for problems of this sort, one encounters a difficultly. It is hard to describe this difficulty without first explaining the technique, but my impression is that this difficulty was the main issue in various other recent incidences-related projects, and that now we might see various other works that rely on Larry’s technique. In his talk, Larry also mentioned that this technique can work for other types of curves, which immediately implies a series of improved point-curve incidence bounds in . A talk by Tao in IPAM. How many of the mathematicians in the audience can you recognize? There’s a lot more to tell, so more IPAM stories later on.